On Valentine’s Day, our thoughts turn to love. Usually it’s the romantic, idyllic, love we see depicted in Disney movies and TV commercials – starry-eyed lovers riding into the sunset to live happily ever after. It isn’t often we see love portrayed as riding out the storms of life instead, truly for better or for worse – the kind of love that has perhaps lost that special feeling. The kind of love revealed when the promise made before one another and God is put to the test by unexpected rigors that squeeze to the surface every bit of faith and courage to hold on. We all hear the statistics…it’s estimated that 50 percent of all marriages end in divorce. But of those couples who pray together in their homes on a regular basis, the divorce rate is an astonishing 0.3%. 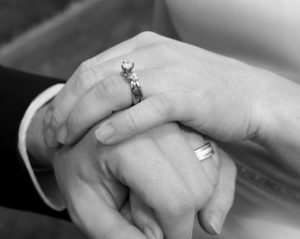 And the Catholic News Agency reports that approximately 28 percent of practicing Catholic marriages end in divorce, far below the national average of non-practicing Catholics. It’s not that Catholic marriages don’t encounter struggles, but strong faith and prayer life are no doubt the glue that holds them together amidst the struggles, and Christ himself binds those marriages to that sacramental promise because it’s built on His love for us and the church. A few years ago my husband and I attended a marriage retreat and one of the presenters drew an equilateral triangle on the board. At each point she labeled self, spouse, or God. Equilateral triangles, by definition, must have three sides of equal length. So the closer you draw to God, the closer you draw to your spouse. And, the closer you draw to your spouse, the more you can see the Light of Christ in them. When you know Christ and include Him daily in your marriage in this way, you experience the love, grace and mercy He extends to each of us and can more easily become that same love, grace and mercy to each other in trying times. It’s learning to love as Christ loves and building a marriage not just out of mutual love for one another, but with the divine love of Christ at the center. We have to remember we have a father who created us out of love; we were His first love. And even after losing the trust of his most beloved creation in the Garden of Eden, he continued to love us all the more by showering us with grace in His infinite mercy and sending His own son in atonement for our sins. sign and sacrament of God’s infinite love for us. And He never lets go.